Hee hee hee hee hee.... I was tired of practicing one day, and so was my boyfriend - from an exhausting day of work, so what better thing to do then to make him learn how to play the accordion! He has asked me in the past to show him how it's done, and for some reason I never got around to it. He's a talented photographer and photojournalist, and has shown and taught me so much about photography, it was about time I returned the favour. He was like, "I don't really want to do this right now" and I said "Sit down!". I showed him how to wear the thing, where to put your hands, and how to sit with it, and yes - I'm still talking about the accordion. I tried to show him what all those buttons are there for, that you have to pump and squeeze the box, and keep it in some kind of timely rhythm, and it's best to do this sitting down at first. Walking comes later. Breathing and chewing gum are for the uber-ambitious. 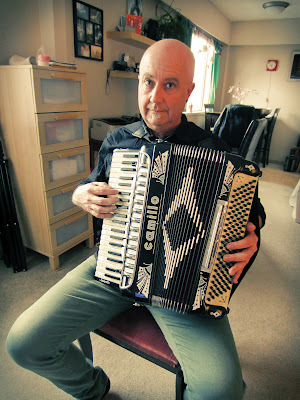 I've had handfuls of people ask for a quick rundown from me about the accordion, and when I'd ask them, "Now, can you feel how the C button has a dimple (rhinestone, jewel, some kind of marking) they usually say "No", and they're usually pissed off that they can't see neither their left hand or the buttons. Then there's having to inform them that they need to cram their fingers closer together to be able to play those buttons. "A 'V' formation! Ring finger - middle finger - pointer finger, back to the middle finger - ring finger!". "I'm too tired right now" he said again. I handed him my 12 bass baby Titan, meant for students, and of course he understood the chords a bit better then. There's more space for you to cram your fingers together on your left hand, it's lighter, and it's less overwhelming quality gives the accordion student a new-found sense of confidence. Then there's the bellows... Hello bellows! Ya, you need to have some kind of control over them. They're the lungs of the instrument, and you're acting as the diaphragm, and like singers, the accordion needs enough air to finish the bar of music. Okay, now for the keyboard on the right side... Nah, maybe later, when you're not so tired and freaked out. "HOW ARE YOU ABLE TO DO THIS!?" Mr. Stone demanded to know, as he realized this instrument is a completely twisted, puzzling, flustering, mystifying mind-game. I answered "It's magic! ".